The use of a water flosser can reduce the existence of bleeding of gums by up to 93%! A water flosser is a more gentle, comfortable and convenient way than the traditional flossing that your dentist always goes on about. In fact, water flossers reach areas of the mouth normal flossing can’t. There is a problem though; many water flossers need mains power which means you are potentially restricted in terms of where and when you use it. Thankfully the cordless water flosser exists and after hours of research and testing we can conclusively tell you which are the best and why. Below you will find our list of recommendations, a brief review of each flosser we have considered, and a link off to our more detailed review. You might want to know a little bit more about why we have ranked these the way we have, so we explain in detail below. It might also be useful to understand a bit more about why cordless water flossers exist and work and why you would even want one. If so, you can jump down the page to our cordless water flosser buying guide. 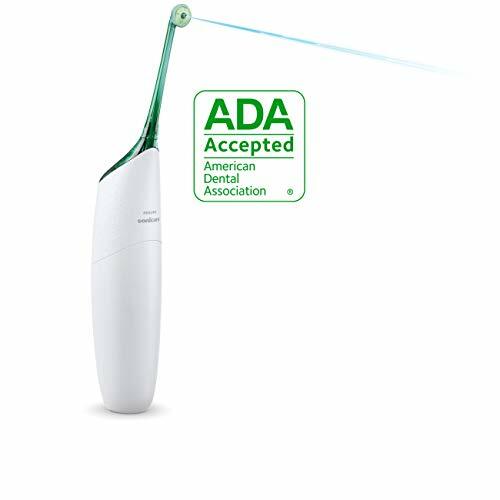 Short review: No need to be bound by wires with the WP-560, this is a cordless flosser that has been approved by the ADA. 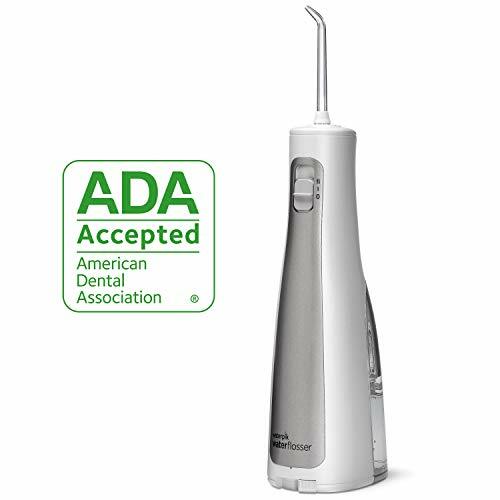 The 360 degree rotating nozzle allows for excellent access to all areas of the mouth. A new magnetic rapid charge systems ensures you can easily recharge the unit when required too. For those that travel a pouch is included too. Not stuck with just 1 color choice you have the option of 5. Short review: For convenience and ease of use, this is the best choice. It is a lot less hassle and feels quicker and more convenient that all of the other options. But, it’s not strictly a water flosser. Airfloss uses a combination of water and air to achieve a similar effect but delivers short sharp bursts getting in between teeth. What makes it so good and desirable is the much smaller profile, it’s cordless, really easy to use and can achieve a clean in 30 seconds. It makes for effortless everyday use. Convenience and simplicity is one thing, but it can’t clean under the gum like a true water flosser can, because not all the bacteria are removed as effectively. Whilst doing something is better than nothing, you should note that the Waterpik is technically better for your oral health. Clinical studies show Waterpik options are better and in truth you know this when you use them. You need less time to get to grips with this. It is a great option for those who known that they would still struggle with getting into a routine of using a normal water flosser. Short review: Powered by user removeable AA batteries you don’t need to worry about mains power with this unit. It is a bit bulkier and perhaps not as friendly for those who like to pack light. But boasting a large tank, different pressure settings, interchangeable tips and being from the market leader, these are compromises potentially worth disregarding given the benefits. The box contents is good with 2 classic jet tips and an orthodontic tip included. A travel pouch and even a travel plug are included. The plug goes into where the nozzle goes to stop leaks. If you like to floss in the shower you can too as this is fully water resistant. Overall pretty good value when you compare to some of the other options and whilst it is not the most compact nor does it have a rechargeable battery, it perhaps is the best all round option giving good performance with flexibility via the AA batteries, a set of which are included. Short review: A low cost option, you get a lot for your money from the Broadcare flosser. The built in battery is recharged via the included power adapter. There are 3 different modes, controlled via a button and completed with LED lights make for easy use and find the option best suited to you. Whilst a 2 minute timer encourages to floss equally around the mouth. There is a lack of replacement nozzles (should ideally replace after 3 months), but it does rotate and can be used in the shower thanks to an IP rating. The small tank is a little frustrating, but it does the job pretty well given the price. 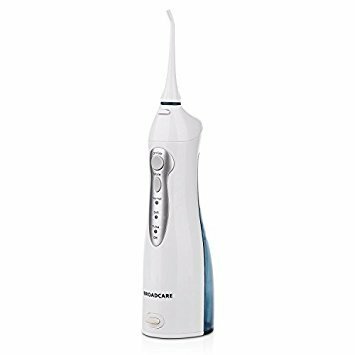 Short review: Very similar to the Broadcare flosser featured higher in our recommendation, the INSMART cordless water flosser is another lesser known brand. That said it is no slouch on the feature front. It offers a built in battery that lasts up to 4 weeks. There are 3 different pressure/mode settings as well as 4 nozzles included in the box. Sadly spare nozzles are hard to come by at the time of writing. LED indicator lights make it easy to see what mode is selected and if it is charging. At 200ml the water tank is no the biggest, but mounted on the bottom it is simple to access and refill. Pretty good value, you don’t have to spend a lot more to get the big brand name. Having tested and reviewed plenty of flossers, we’ve put together the guide below based on our own experience and questions. If there’s anything else you’d like to know, please leave a comment at the bottom of the page. Right, let’s not mess about here. From a science, everyday use and results perspective you are going to get the best experience from the larger, bulkier and mains hogging countertop water flossers. They will normally offer more features such as variable pressure settings and larger water tanks that ultimately affect your user experience. But, the cordless and wire free options are good enough for the vast majority of us and still bring significant benefit. If you think a countertop water flosser may be a better fit for you, check out our article on the best ones here. What is a cordless water flosser? 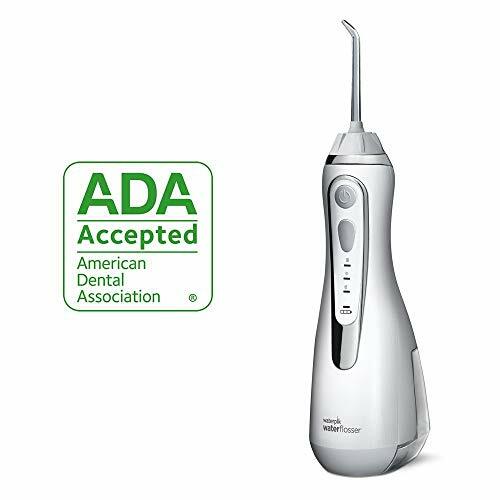 A cordless or portable water flosser is an oral hygiene product that is powered from built in batteries. When switched on, the batteries power the pump that draws water from the refillable tank/reservoir and pushes this out at pressure via a nozzle you align with your gumline. The water dislodges food particles, bacteria and plaque both on and underneath the gums, that was not removed through regular brushing to leave you with a cleaner and healthier mouth. Water flossers are a type of interdental cleaning, like regular flossing or interdental brushes, which should be used in addition to brushing (preferably with an electric toothbrush!). No power cable means you can move around more freely and floss where and when you choose. This is particularly helpful for those who travel frequently or do not have a power outlet in the bathroom. Oh and if you see the words oral irrigator, it’s the same as a water flosser it’s just another name for them. Waterpik is also a name you will see, this is in fact a brand name that has become synonymous with water flossers. There are pros, and cons, to water flossers in a general sense as well as those that are specific to cordless flossers. For example all water flossers cordless or not tend to be easier to use, softer on the gums, offer a better clean and reach more of the tooth surface in comparison to regular flossing. A con is that the technique does take some getting used to and they are initially anyway, more expensive than normal string floss. 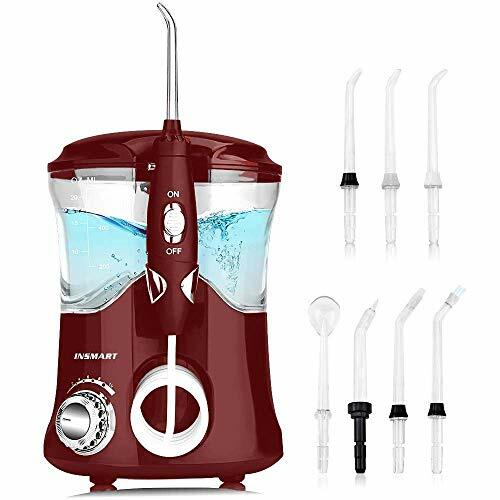 Listed below are what we consider the pros and cons of cordless oral irrigators specifically. Much smaller than the countertop alternative they can be stored out of sight, taken away when travelling as they will more easily fit in a bag. Batteries inside the flosser, be those user replaceable or rechargeable mean you are not attached to a power outlet and you can go where you want with the flosser. Not tied to the 2 pin socket in the bathroom. To be portable, the flossers need to be smaller and the tank is the biggest compromise. Often enough to just do the job, you have to frequently refill. The batteries are built in and need recharging or are user replaceable AA design often. They need frequent charging due to the power used and often the chargers connect to 2 pin sockets, which is one of the appeals for going cordless in the first place. Do I need a portable flosser? None of us NEED one, but there are health benefits from owning a water flosser. There is then the added benefits such as size and portability that the cordless option bring which in truth generally outweighs the cons by quite some considerable distance. With over 47.2% of over 30’s in the USA alone suffering from gum disease according to the Centre for Disease Control and Prevention, and the proven benefits of the water flosser there are very compelling arguments to own one. Common signs of gum disease are red or swollen, tender or bleeding gums. This is normally caused by poor oral hygiene and regular flossing can help, but water flossing in particular is more effective and comfortable to do. A 2013 study found that the addition of a water flosser to a daily oral healthcare routine resulted in a 93% reduction in bleeding and up to 52% better at reducing gingivitis (inflamed gums) than traditional dental floss. Other studies have shown that water flossers are able to remove more bacteria, reduce more bleeding, plaque, and gingivitis in comparison to interdental brushes and to just toothbrushing alone. Dr. David Jolkovsky, a diplomate of the American Board of Periodontology, wrote a literature review that unequivocally showed that a Waterpik Water Flosser reduces inflammation, removes bacteria from deep periodontal pockets, does not cause damage to mouth tissues and is in the same range as brushing teeth, flossing, and using wooden sticks in the incidence of bacteremia. Recent guidelines also recommend that the use of a water flosser is even safe for those who require antibiotic cover for dental treatment. Such high praise has made water flossers a must have healthcare gadget, but daily life means the countertop option is not always practical, particularly if you lack a power outlet in the bathroom or travel frequently. As you will see from our recommendations at the start of the article, Waterpik and Sonicare are just two big brands within this space, but ultimately Waterpik are industry leaders. What makes a good cordless water flosser? So although compromise for some features has to be made to make a cordless flosser portable there are some key things to look out for. You will see that our highest ranking recommendations will boast these features. Smaller than the countertop options it is about finding those with the largest tank but keep the unit portable. Adjustable pressure can help ensure you get a more comfortable user experience. The best cordless options will offer at least two options here, typically high or low with a pressure measured in Bar, varying from 3.1-5.2. It is somewhat of a catch 22 in that you want the largest tank, but you want flosser to be small enough to be portable. Frequent travellers take note of the size and ease of which it can be fit into a bag. The more premium models, particularly those from Waterpik offer a range of different styles of interchangeable tips. Whilst the classic jet tip is most common across all brands, the more specific options work well for particular user requirements. Those with braces will wish to make use of the orthodontic tip whilst those who have dental work such as implants, crowns and bridges will find the plaque seeker tip most beneficial. Some allow you rotate the nozzle, they are not completely fixed giving greater flexibility in reaching certain areas of the mouth. Some rotate a full 360 degrees thanks to a click wheel style adjustment. Depending on the model you choose will depend on the exact power and connector that comes supplied with it. Most power cables for recharging the water flosser come with a 2 pin US connector, designed to be connected to the power socket found in a bathroom. Some do come with replaceable batteries , which can be a real winner for some. Subject to change between models and manufacturers, most come with a 2 year (24 month) warranty that will cover any faults that are not as a result of user damage. An example might be the pump failing to push water through. You will need to contact the manufacturers respective customer service line but will likely need your original proof of purchase and once accepted arrange repair or replacement of the product. Due to the size and slightly more specialised nature of the water flosser, sadly the availability is not quite as great as most other dental products. You are less likely to see a wide range in your local grocery store, but bigger stores and pharmacies like Walmart, Walgreens and CVS do offer them. Many manufacturers offer their own online stores and then there are the other retailers like Amazon and Walmart who offer a wide portfolio of products. I’ve used up 3 Waterpik WP-450. They just don’t last! They work great when new but after about a year the batteries fade, and they are not replaceable or repairable. I don’t think you should have to buy a new appliance every year. Thanks for the feedback. I agree with you on not really needing to replace the product every year. It would seem they are failing outside of the warranty period, which is very frustrating. Have you spoken to Waterpik? If so, have they said anything? Given you have bought 3 and they have failed, can I presume despite your dissatisfaction at this, they do a good enough job to make it worth it for you?